In May of 2010 Wigan Athletic supporters were to hear that their club had made a ‘Bosman signing’ of a Paraguayan centre half from a club in Belgium. A month later, on June 10, Antolín Alcaraz was to make himself known on the world stage when he scored a headed goal against Italy in Cape Town. The 1-1 draw helped steer Paraguay into the World Cup quarter finals. But who was Alcaraz and how did he get into his national team despite never playing at senior level in his own country? Aveiro is a prosperous coastal town in central Portugal. It is often called the ‘Venice of Portugal’ because of its canals and boats. It is home to SC Beira Mar whose crowds rarely reach five fugures. One of their claims to fame is that the great Eusebio played for them for a brief time in 1976. When the 21 year old Antolín Alcaraz joined them in January 2003 they were in the first division, although the club has oscillated between the first and second divisions since then. Alcaraz was to spend four years in Aveiro, cutting his teeth as a professional footballer, becoming Beira Mar’s defensive lynchpin and captain. He was to pick up the first of his 22 caps for Paraguay in his final season at the club. Antolín Alcaraz comes from a humble background. He was raised in the south of Paraguay in San Roque González, a town of around 12,000 people, some 100 km from the capital Asuncion. After joining Racing Club of Argentina as a teenager he was snapped up by Fiorentina, but at a bad time since the ‘Viola’ were to be relegated to Italian lower leagues because of financial problems. He left, and after a trial with Palermo, headed for Aveiro. 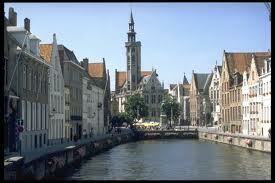 Alcaraz was to leave Aveiro in July 2007 to move to another place famous for its canals, Bruges. Club Brugge were a more well known club than Beira Mar, having reached two European finals and won the Belgian league 13 times. During Alcaraz’ time in that beautiful city the club finished in the top three each year. In the 2008-09 season Alcaraz made six appearances for Club Brugge in the UEFA Cup, when they were knocked out in the group- phase, although overall they had only lost one match in the competition. He made seven appearances in 2009-10 in the newly formed Europa League. Brugge qualified through the group stage but were to be undone in extra time at Valencia. Alcaraz has been a regular member of Paraguay’s side since the World Cup, his team reaching the final of the Copa America in 2011, beating Brazil on penalties in the quarter final. Strangely enough the Leeds-Liverpool canal runs right next to the DW Stadium. It might lack the beauty of those in Aveiro and Bruges, but certainly played its part in the Industrial Revolution and today offers pleasant walks along its paths. Not that Antolin Alcaraz will be too concerned about that. He will be focusing on two things: helping Wigan Athletic avoid relegation and finding himself a new contract for vnext season at 30 years of age. One has often felt that the best has been yet to come with Alcaraz. He has had his ups and downs with the club, including a controversial red card in December of 2011 for spitting at a Wolves player. He made 34 appearances in his first season, but only 25 in his second due to injury. However, his return to the team in April last year was crucial in providing a solid defensive backbone alongside Gary Caldwell and Maynor Figueroa . A defence that had been leaking like a sieve was to concede only 10 goals in the final 11 league games. This has been a frustrating season for Antolín Alcaraz, with 6 months out through injury. However, once again his return to the team has stabilised the defence. His partnership with Paul Scharner promises to be something special. For once Wigan have height and pace in the centre of their defence. The way the two players have gelled in the Everton and Newcastle matches has been quite remarkable, given that Scharner had left Wigan when Alcaraz arrived in 2010. There is no certainty that either Antolín Alcaraz or Paul Scharner will be at Wigan next season. At the moment they are both playing the best football of their Latics careers. If they can continue to do so until the end of the season it could mean Wigan achieving the double goal of Premier League survival and playing in the Europa League. And who was to know that Wigan would make their European debut in Brugge? It’s a pity that Alcaraz – a hero of the FA Cup Final – wasn’t still with them. But they did gain a goalless draw against Zulte Waregem.